Jossie continues to do well - her weight went slightly down to 3 lb 5 oz, but that is to be expected of all newborns. 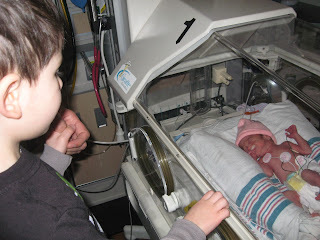 This is going to be her real Everest - basically eating her way out of the NICU. They told us she'll lose about 10% of her birth weight (which would put her at about 3 lb even) and then will start to rebound from there. We're hoping that it happens sooner than later. Everything else continues to go well - strong lungs, heart and oxygen levels. Her 48-hour culture tests came back negative so she's been taken off any antibiotics. Her little belly needs to digest food better - she's currently taking 4 ml of breastmilk at each feeding. If she can digest it better (and things looked better today), then they will up her to 8 ml per feeding. She and I have been doing some serious kangaroo care today - three good skin-to-skin sessions. It is restorative for us both - when else in your life can you just sit there in silence with your baby curled up against your chest? It is wonderful and magical. I just hope it really does wonders for her and helps her to grow and grow. Jack visited his sister tonight - he's had a lot to deal with in the last two weeks, so he was a little overwhelmed by it all. Only siblings are allowed in the NICU, and the children must have their temperature taken before entering. A simple task turned into a big deal as Jack twisted and turned, and Jeremy and I had to hold him down, crying, to take his temperature under his arm. All was forgotten as he got to use our "magical" door pass that automatically opened the doors. Jack was curious about Jossie, asking if this was the baby in his belly. I think it's all still sinking in for him. A few minutes passed and he looked at us and said, "Can I have a treat now?" I'm off for one more visit with dear Jocelyn. Good night!